Cats are awesome. Our furry friends are affectionate on their own terms but when they want your attention they will get it at any cost. Ville, a cat from Sandviken, Sweden, has been dubbed “The Most Loving Cat In The World” and when you see her video you’ll understand why. 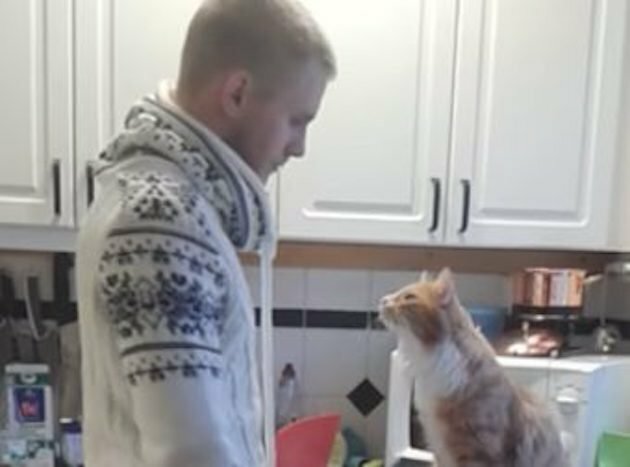 Every time Ville’s human is about to leave their home, they share a goodbye ritual that will steal your heart. Check out how adorably cute this human and cat are together! Cats might be the most affectionate of all animals because when they share a kiss, a cuddle, or a goodbye, it’s on their terms and they really want to engage with the person they choose to show affection to. Share this post if you love this goodbye ritual!